Volatility seized Wall Street following Wednesday’s Fed announcement. But it was bank stocks that bore the brunt of the damage, which is unfortunate. Many of these money centers were just starting to emerge from well-established bases that could have supported their next up-leg. As expected, the Fed held the target for the benchmark rate steady at 2.25% to 2.50%. Furthermore, Jerome Powell and crew indicated that they wouldn’t be raising rates any further for 2019. In fact, the next move could be a rate cut. With rates potentially at their peak for this cycle and future GDP growth projections getting slashed, investors jettisoned financial stocks from their portfolios throughout the afternoon. The Regional Bank ETF (NYSEARCA:KRE) was hit especially hard, falling 3.4% amid massive distribution. Relative weakness continues this morning with most banks in the red while the rest of the market is ripping. Let’s take a closer look at three bank stocks that are suffering. You should avoid two of them while buying the third. Yesterday’s swoon upended what was otherwise a beautiful breakout in the making for Bank of America (NYSE:BAC) — and other bank stocks. Here’s my technical take. Since gapping higher mid-January on better-than-expected earnings, BAC stock built a clean two-month base. But with the break attempt now rejected, we’ve returned to the chop zone. Thus far this morning’s testing of the range’s lower bound is holding, and that’s a good thing. Bulls do not want to see a close below $28 support. 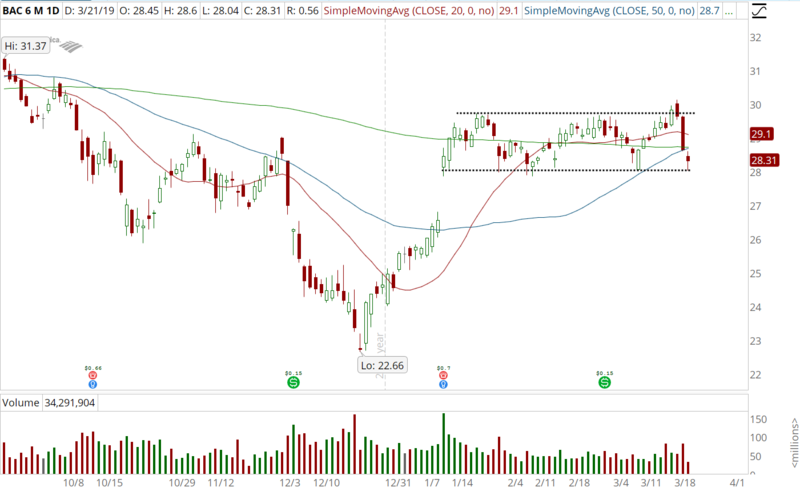 Until BAC can clear the ceiling at $29.80, it’s dead money, so steer clear. This year’s behavior in Goldman Sachs (NYSE:GS) has mirrored that of BAC. I’m tempted to copy/paste my previous commentary. Mid-January earnings gap. Two-month base. Failed breakout. Back to chop. That sums up the price action. Yesterday’s drop and this morning’s follow-through carried GS stock back below its 50-day moving average. We’re in no man’s land here. Until GS can re-establish itself above $200 — stay away. For you bears on the prowl, there’s a decent short trade if Goldman breaks $189 support. While the weakness in most banks stocks is a sign to steer clear, I’m finding the drop a welcome development in the credit card space. 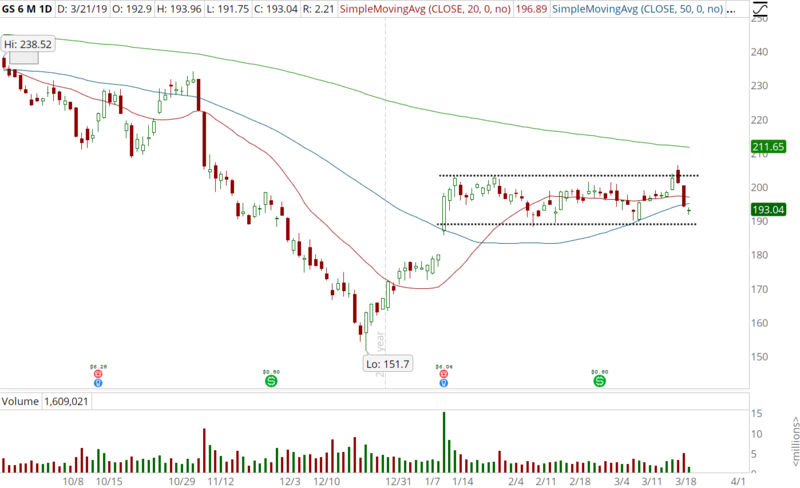 American Express (NYSE:AXP) was flying high — it was extended, in fact — and due for a retracement. Yesterday’s Fed shenanigans gave traders the excuse needed to ring the register. And now, we have an attractive buy-the-dip opportunity on our hands. 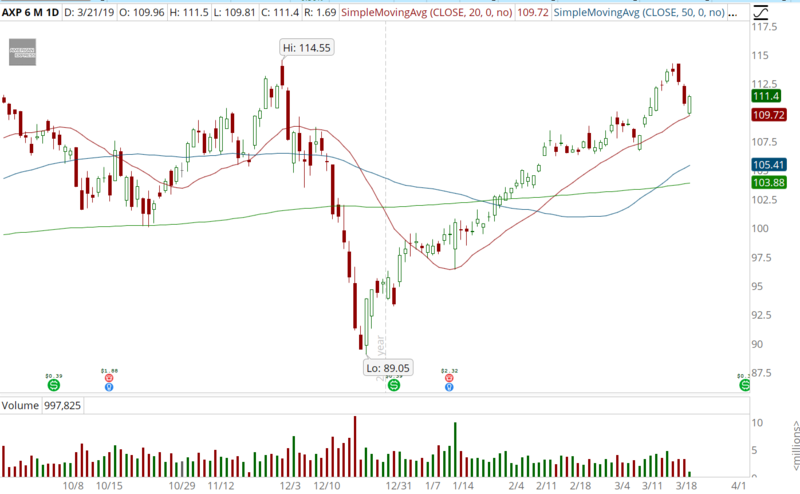 This morning’s gap into the rising 20-day moving average was swiftly bought up, and AXP stock is forming a strong bullish piercing candlestick pattern. Buy the May $110/$115 bull call spread for around $2.40. The risk is limited to $240, and the reward is limited to $260. The post 3 Bank Stocks Whacked Down by the Fed appeared first on InvestorPlace.